The DFID WASH Facilities through UNICEF implemented partner “Living Water International in Sierra Leone” has provided WASH facility to the Brama town, in Constituency 095 in the Western rural district. Welcoming all present, the Head man of the Village, Brima Mansaray expressed satisfaction over the intervention of DFID, UNICEF and Living Water International. He commended the government through the implementing partners for coming to their aid. 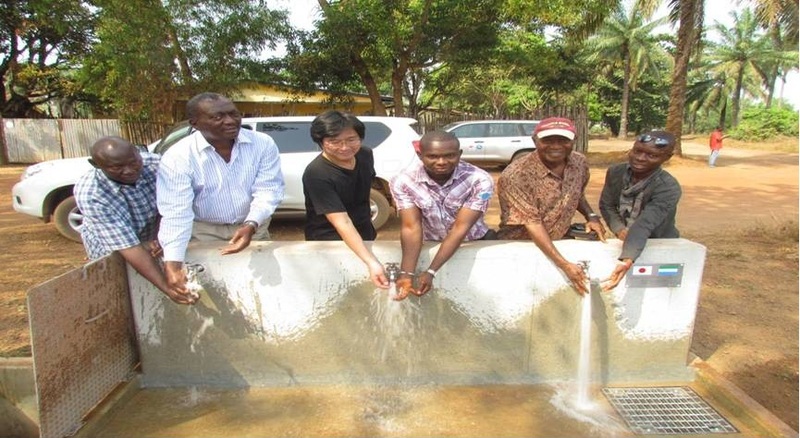 Making a statement the Country Director of Living Water International in Sierra Leone, Hastings Banda said his organization is involved in water and sanitation process. He said they have constructed wells, and sanitation key in their delivery process. He pointed out that they have provided support from training people on WASH, and promote a lot of hygiene systems in the country. He noted that their focuse is improving on water, sanitation and hygiene at deprive and hard to reach community also to vulnerable people. He paid thanks to government for providing the enabling environment for them to operate. He recalled that living water is one of the NGOS working in Sierra Leone with special focus on wash in schools, PHU’s, towns and villages. In their intervention on toilet they provide also for the disable and tech school on the importance of hand washing especially at critical moment. In his statement, UNICEF representative, Sandra Lottoot said the rural water project which is funded by UK Government set to benefit 150,000 people across the country in improve water, sanitation and hygiene. The project also stands to benefit 40 children in 180 primary schools, and users of 175 health care facilities. She said the intervention of UK government has help to save lives from diarrheal diseases such as cholera and dysentery. She said the project is a demonstration of partnership with the government of Sierra Leone, UNICEF and implanting partners such as Living Water. She commended Ministry of Water Resources for their leadership in the process. She said hygiene and sanitation linked to three leading causes of fewer than five mortality, malaria, respiratory and diarrheal disease. She pointed out that hand washing is a key behavioural that can save life. She urged community people to make hand washing a habit just likes during the Ebola period. In his statement DFID Senior Information Adviser Simon Kenny said 63% of household have access to safe drinking water, 13% have access to improve sanitation and 22.9% of primary schools have access to functioning safe drinking water. He said there is still work to be done. He said in rural areas only 48% have access to improve sanitation facilities. He said hand washing play a significant role in the Ebola and that we must continue to make progress. He said the UK government has committed to help people global get access to clean water and sanitation over the next five years. He said UK aid is committed to support government of Sierra Leone in improving rural communities as part of the recovery plan. In giving his keynoted address, thanked the UK government for their support in the WASH sector. The Minister noted that the responsibility on them as a governed has been done but they community people should take ownership of the facilities. The minister encourage parent to educate their children so that they can give back to the community. Accessing water supply and reliable energy are key indicators to enhance sustainable economic growth and development of any country, which is lacking in Sierra Leone, and remains a challenge. This statement was made by Madam Dana Hyde, Chief Executive Officer (CEO) of Millennium Challenge Corporation (MCC) on Saturday 22nd October, 2016 during her feasibility tour of water projects at different communities in the east end of Freetown. The CEO and entourage, inclusive private and private sector partners, in their assessment tour visited the Dockyard community water facility, the Moeba community Mambaridge water facility and also the Guma Valley dam where they met with community stakeholders. Prior to their community tour the team earlier on met with the Civil Society Organizations (CSOs) and other key stakeholders. The corporation based in the USA had provided a grant of $44,4M as threshold program for Sierra Leone to support the development drive and strengthen the water sector in deprived communities and to access reliable energy. The CEO said the grant is expected to address the delivery of electricity and water in Freetown, noting that it will also strengthen public regulation and accountability and create a framework for sustainable public and private investment in both of these sectors. Talking to journalists at the Mambaridge (Moeba Community) School on the strides Sierra Leone as a nation is making, the MCC Boss said though there are rigid indicators, yet they are impressed with the on-going activities for reliable energy and access to clean water and opined that Sierra Leone will meet the indicators. Sierra Leone is making progress on the threshold program though there is more to do as the criteria are tough for a country to be selected as eligible for an MCC assistant. Though the program is key to provide water to deprived communities, MCC also help in providing electricity for school going children to help them in their studies and improve on the energy sector, thereby helping hospitals to treat patients with better equipment. At Ward 365 Constituency 102 Kissy Dockyard, Councilor Ibrahim Adissaya Kamara said the installation of the water facility by ACF in the community has helped greatly in the reduction of key menaces in the community and its environs like the reduction of Teenage pregnancy and prevention of illnesses. These two were serious challenges before now in the community and its environs that hold over ten thousand people, school children and women inclusive. 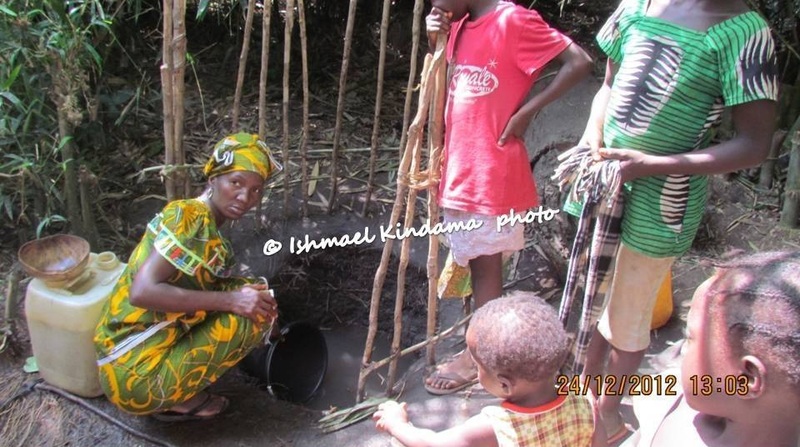 A suckling mother Rugiatu Tarawally said for six years the community had been without water. Madam Koroma at the Mambaridge (Moeba Community), a caretaker of one of the installed water facilities, said people pay only one hundred Leones (Le100) per container and the proceeds used for the maintenance and payment of stipend to volunteer staff. The team before coming to Sierra Leone had visited Ghana and Benin and has proceeded to Liberia. underscored the importance of the technology centre. He said as a ministry, the WASH Technology Centre is their first child in the ministry since they have been established as a new ministry in charge of Water Resources. He pointed out that for effective service delivery on WASH, people should be training at the centre in order to get the require skill to perform. He added that this enhances creativity in providing WASH manual for household and vulnerable communities. Director Suma cited the effective marketing of the centre’s initiative in providing such WASH technology in country and at international level. He encouraged other international partners in WASH, district and City councils, and other partners to come to their aid in strengthening capacity build of the management and the centre as a whole. He pointed out that with such programs, a good number youth will change their mind set to development that can benefit the individual and the country as well. Her said education can be done through skill training like WASH that can earn you income. He encouraged all present to put in practices activity that can sustain the centre. in a conducted tour prior to the officially launching of the centre, the Project Head, WASH Self Supply Lahai E. Bunduka said the WASH technology and training centre is a scheme that enhance self made-hand pump, outlet pressure rating of 5 bars that is capable of raise water 60 meter vertical high and a distance pumping about 2km. He said the center can also provide odorless toilet, shower room, storage tank, underground tanks, rain water harvesting and micro irrigation at cheaper rate. In his statement, Dr Josef Fuchs from EMAS International expressed satisfaction over the effort made by the technical and the Project Head, WASH Self Supply Lahai E. Bunduka. He said the mandate and responsibility of EMAS is to ensure that people live a dignity life. He encouraged people to work in collaboration in making ownership of the facility in their community. He said the centre will benefit generation yet unborn and therefore must be protected. Dr Otten from Welt Hunger Welfe and the Director of Welt Hunger Welfe Ursula Langkamp commended the effort made by the management of the centre. He pledged more support to ensure that the center achives it intended purposes. Other speakers who also expressed happiness over the center include the Crossing village chief and the representative from the Waterloo Rural District Council Deputy Chief Administration and Chief Alusine Fofanah respectively. A comprehensive tour was done to get the human face of the facilities at the centre and for people to get a clear understanding about the uses, importance and benefit of those services at all level. Cutting of the tape climaxed the ceremony. As the world observes World Water Day, a lot of issues affecting the water sector in various parts of the country are being discussed and solutions advanced as to how to ensure that people, mostly the deprived and marginalized, have access to affordable water in their communities. Due to the importance of water in our daily activities, much prominence is being accorded to this sector to ensure that it is preserved and sustained to meet the demands of the users. Taking this aspect into consideration, March 22nd has been set aside as World Water Day, and with a host of panel discussions on the international scene, and presentations on the status of water, the challenges, and the way forward. In developing countries while the Governments and development partners are striving to ensure that people are accorded pure water , it is becoming a matter of fact that private water companies are infiltrating the water sector to produce substandard water that are sold to the public. Based on the fact that effective monitoring mechanisms are not in place for staff to go round the country and take a closer look at the environment or equipment and labourers processing these packet water, some of the private water company operators are more interested in the money derived from their sales rather that the quality of the product reaching the consumers. In Sierra Leone, there has been a lot of reports from the public that some of the private water companies were producing substandard water that contained particles or stink. Despite all these stories not much has been done as new private water companies continue to emerge without going through the correct registration process. In towns and villages, it is now common to hear of people with just a single room and palour embarking on the sale of packeted water to the public. This is so as majority of the masses are now in higher demand of packeted water rather than pipe borne or dug out well water. This ugly situation reached its climax early March, 2016 when the Sierra Leone Standards Bureau published its findings on the status of private water companies operating in the country. In a press release issued to the public, it was noted with dismay that when a test was carried out by this body on the quality of the water product sold to the public by a total number of over one hundred and sixteen private water companies operating in the city of Freetown only twenty of these water companies were satisfied to have met the standard requirements stipulated by the bureau for the sale of packeted water to the public. This dismal situation is very alarming especially when the findings is only for the capital city where many are of the view that effective monitoring should have been put in place. Today, some of these questions are making the rounds as to why private water companies continue to put the lives of millions at risk by selling substandard water to the public. What punitive measures are to be instituted against these companies embarking on these criminal activities? What modalities will be speedily put in place to halt further production of dirty and stinky water, not only for the city of Freetown but also in the provincial towns. According to Mr. Lansana Kamara, a senior civil servant, the scarcity of pure and affordable water during the dry season is not a reason for private water companies to exploit the masses with fake water product. He furthered that the Sierra Leone Standard Bureaus, the Electricity and Water Regulation Commission and the Sierra Leone Police intensify their monitoring activities to arrest this situation. The release states that the Commission is hereby demanding that the under listed water producing companies cease production and withdraw all products from the market nationwide and with immediate effect. The release furthered that the company should resume production after the water quality should have been reassessed and certified by the Sierra Leone Standards Bureau and their status regulated as a water producing entity after being licensed by the Commission. As a warning to these private water companies producing substandard water for the public, it was noted that any action on the part of the these companies which is contrary to the directives above will face the full penalty of the Law as stipulated in Section 65 of the Sierra Leone Electricity and Water Regulation Commission Act of 2011. One remarkable feature of the SDGs, is that no sooner it was adopted, its popularization has kicked off. It is with this back drop that one can state that both developing nations and developed ones are currently setting the stage for the implementation of the three dimensional aspects of the SDGs, namely the Social, Economic and Environmental aspect to eradicate poverty in all its forms and dimensions, combating inequality within and among countries, preserving the planet, creating sustained, inclusive and sustainable economic growth and fostering social inclusion. In the area of the water sector, adopting the 5Ps, theory; ”: People, Planet, Prosperity, Peace and Partnership-would ensure that access to pure and affordable water becomes a reality for both the rich and the poor. Looking at the Participatory Approach, the citizens are not only going to have a saying in the water service delivery system in their communities, but will also get ownership of the project. That is they take part in the development process, they monitor and evaluate each stage of development. Let us look at this scenario. Last week Friday, a presentation of the national budget in the walls of parliament was read by the Minister of Finance and Economic Development Dr. Kaifala Mara h, the money allocated to each ministry was read out and the projects to be undertaken were also spelt out. Under the water sector. the three urban towns water project, the Taiama-Njala Water Service delivery system and a host of others were listed. My take here is the Taiama- Njala Water Service System, I did an investigation some times back on this topic, before the rebel war, residents of this town had pipe born water flowing and one just had to open the tap in their houses, and then water was ready for drinking. Over twenty years now, access to pipe born water is a nightmare, so most have been accustomed to the Taia River, children spend most of their time at the Taia River while the structure and machinery spare parts are stolen and sold as scraped metal. Now that come 2016, this project is going to kick off, there is need for the citizens to be involved at all stages. The people must know the budget for the work, the timeline for its completion and must be involved and assigned responsible positions so that they will help to protect the facilities. As most have been accustomed to drinking the Taia River or spending must times at this place, it is expected that the Parliamentarian, Local Councils, youth groups and elders begin to educate the people on the need to connect to the main source of the water service delivery system, pay their water rates and take ownership of it. The reason being that many will say, we have the river flowing so there is no need to pay for water service in our town as it happened sometime back in the Kambia District. They must be convinced that the quality of the pipe born water is far more preferable to that of the polluted river. In the water sector, it is the right of the marginalized in the remote areas to have access to water. It is hoped that slum areas that are starving will be catered for now with the expansion of water facilities to the rural areas, there is the need for boreholes to be constructed where the pipe born water is not accessible and householders must be ready to pay a particular rate that would be used to upkeep the facilities and payment of the caretakers. The environment plays a key role in the sustainability of any water service delivery system. Laws must be enforced to protect these areas and the people encouraged to plant trees to address the issues of climate changes that is currently posing serious challenge to our struggling water dams. It is unfortunate that while the Ministry of Agriculture is embarking on tree planting activities at community level, some of the Foresters stand to be accused of encouraging people to embark on felling of trees and unhealthy practice that are exposing the soil to land degradation. A typical example is the Forest Reserve at Okra Hill where massive deforestation has been done by people without replanting trees. As a way of addressing this issue, bye laws by the community elders must enforced and government must levy heavy fines and punishment on those involved in these illegal act of logging. Access to Information is necessary for the growth and development of any institution. In the water sector, most people are ignorant of the laws relating to access to water. These laws are enshrined in the constitution, but very little is made know to the masses. With this, there is the need for massive sensitization on these laws on media, community radio discussions, workshops, and engagement of the locals at all levels. It is believed that in a situation where the citizens are grounded on the laws governing some of these institutions then the more, the people will be in a position to abide with them. Today, the Commission of the Right to Access Information has been established so it must be seeing that this body makes its presence felt at all levels so that the information on sensitive issues get to the grassroots people. Another body that helps in keeping the public in touch with the activities of Government of the Open Government Partnership that provides a platform for the people in their communities to ask their parliamentarians, government officials and contractors on their activities. It is believed that when these bodies operate independently, and in the interest of the country rather than political interest, the Post 2015 will transform the lives and community of the masses. Most people are of the notion that water is a free gift in the country and one should not pay a cent to afford it whilst the Government holds the notion that to maintain water service delivery sustainability, the masses must be in a position to pay water rates and other charges so as to pay workers, secure more machines, and also to repair and construct more water resources. This area of conflict is posing adverse effects on the operations of the Water Resource Ministry in ensuring that the people, especially the poor that are in deprived communities, are accorded pure and affordable drinking. As a result of this gap between the rich and the poor in accessing water, there is a lot of social, economic and environmental impacts on water resource management. As the struggle between the rich who can opt for all means to secure water at all times, and the struggling poor, some business water companies and some officials are having a field day in embarking on corrupt practices that is affecting the water service delivery system in various parts of the country. 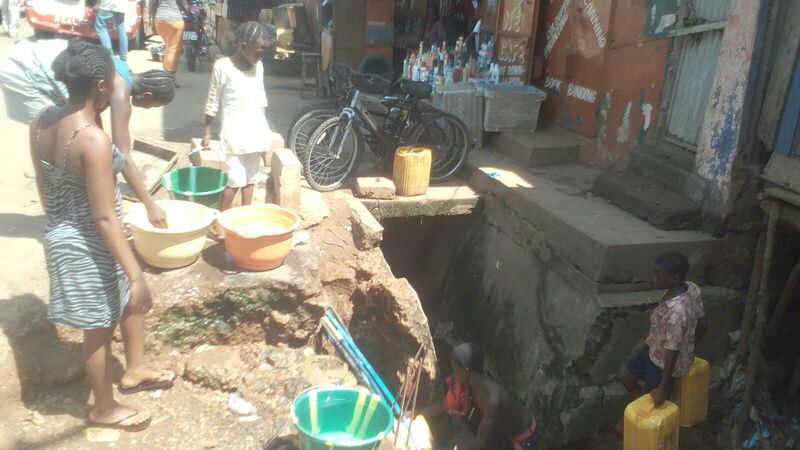 It is a common practice for the youths to either divert the flow of water from the main resources to the households by illegally using rubber pipes and charging inhabitants or the less privileged to pay money that go into their pockets while those paying their bills go without the service for some time. This situation has degenerated to a point that in broad daylight along the major streets of the city people are visible with cans or buckets in their hands destroying the pipes to scoop water. The unfortunate aspect of this situation is that most of these pipes are located in drainages that are very filthy or with poor sewage facilities, thereby polluting of the drinking water or serving as breading grounds for the transmission of water born diseases. This issue can be addressed if effective monitoring mechanism is instituted to protect the structures for effective water service delivery and educate the people on the dangers involved. Another disheartening corrupt activity in the water sector is the act of private water companies not going through the correct processes involved before selling their products to the masses. For a water company to be accorded the right to operate in a state, it must be registered, samples of the product tested and later the structures evaluated. Today with the desire to exploit the masses, some of these private water companies after registration waste no time and start the processing and selling of untested water to the public. Barely a week ago the Management of Family Care Water implicated the Management of Sierra Spring Water for using their brand. According to report, the Management of Sierra Spring Company located at 27 Gordin Street, Aberdeen is currently being investigated by the Aberdeen Police Division on allegations ranging from forging and using Family Care Water Company brand to packet and sell water to the public. This issue came to light when the Head office of Family Care was stormed by the Sierra Leone Police, the Media and some customers on the grounds that some of the water plastics sold to the public contained a lot of particles that will affect the human system. With this dismal situation, a team from the Family Care Water Company contacted Roxy Building to inquire if there is any other organization or company in the country that had registered with that name. As there was none, the search team mounted an investigation and on Thursday, they were able to locate a hideout at 27 Gordon Street operated by one Mr. Mohamed Turay. In the said building, it was realized that Sierra Spring Water Company had a lot of packet Family Care Water bundles that were to be sold to the public. The office of Standards Bureau was alerted on the issue of Sierra Spring Water Company using their brand to sell packet water to the public. Inspector Martin attached to the Water Industry of the Sierra Leone Standards Bureau visited the scene and placed the company under lock and key with the message that the Manager of Sierra Spring Water Company must report on Monday 20th October, 2015 to help in the investigations. The Management is to explain how they acquired the brand of Family Care Water plastic, the process of registration to establish a water company and other relevant documents. Visiting the scene of crime on Saturday, a key stakeholder (name withheld) disclosed that indeed he has been operating the place before, but due to hard times he stopped business and decided to rent the place to Sierra Spring Company. In a situation where they are being implicated in using the brand of Family Care, that is not an issue for him to comment on. Speaking to the Public Relations Office of Standards Bureau Mr. Abu B. Bah on the said issue, it was revealed that when the matter was brought to their attention, Inspector Elvis Mohamed Koroma was dispatched to the crime scene and the following findings were made; the Management of Sierra Spring headed by one Mohamed Turay was using the plastic roll (sachet) of Family Care Water Company to packet. It was realized that the packet water sold by Sierra Spring was not tested at the Standards Bureau so the officer was left with no option but to seal the door with the serial code 000995/000971. Already samples have been collected for analysis and this will lead to police investigation and charging of the matter to court. All efforts made to get the side of the Manager of Sierra Spring Water Company. This problem can be addressed if Standard Bureau embarks on massive on the spot check of these water companies to ensure that they comply with the laid down procedures at all times and defaulters fined or have their licenses sized. In the area of awarding contract for the establishment of bore holes or standing pipes in many places, during the dry season, most of these facilities are non functional on the grounds that the contractors failed to actually reached the water level. In a situation where this happens especially in the provincial areas, most of the pipes are either sold to scrap metal business people or criminals have a field day with these equipment. If such a situation is to be addressed, credible contractors that have vast ideas in drilling for water must be awarded the right to undertake such a venture. The incidence of Landslide, heavy storm, flooding and pollution in urban areas or the cities are being viewed by many as a result of man’s unplanned activities on the natural resources. The rapid growth of the urban population in Sierra Leone could be linked to the Rebel War Era, when there was forced migration of the rural communities to the cities and other provincial towns, thereby putting considerable pressure on the resources and facilities in these places. At the end of the war, most of the youths deliberatly refused returning to the villages to continue their farming as some were engaged in petty trading while in the camps. As most were unskilled or could not secure a decent office job, including the high cost of renting houses, the option to many was to reside in the slum areas (along the coastal areas or mountanious regions) that were overcrowded and lacked the basic facilities. During that period, there was massive deforestation as some turned to the buring of coal, cutting mangrove wood, as the government was more focused on fighting the war rather than with administrative issues. With this, many took the advantage of even banking the swamps or the watershed areas to build their houses. As tress in protected forest areas were cut down, houses sprouted up along the hills exposing the land to environmental hazards. In the city of Freetown, a lot of challenges were envisaged by the Guma Valley Dam that supplies the city and its environs with pure drinking water. The water service delivery mechanism was not effective as the population trippled the targeted number that the dam was to provide affordable water for. The pipe lines were obstructed (cut) by the marginalized population to scoop water, thereby depriving those that were paying water bills for their houses. This in other words deprived the government of the needed income to generate in meeting the cost of water service delivery. The situation was worsened by the lack of effective policy implementation to halt this negative practice of misusing the water service distribution to various destinations. With the growth of the urban population, there was massive encroachment of the water catchment areas, more so in places closer to the dams which in turn exposed the water reservoirs to a high rate of evaporation, pollution and deforestation. At the end of the war, several sensitization programs by the government and key stakeholders were conducted to raise the awareness on the implications of man’s negative activities on the environment and its implications. The 16th September flooding was one the worst ever recorded in the history of the country. As confirmed reports indicated, eight people lost their lives and properties worth billions were destroyed. Although there are plans to relocate these affected communities on the outskirts of the city, we are yet to see if they will not go back to the same disaster prone areas as it had happened in the past. Urbanization is a challenging issue for government and stakeholders in meeting the needs of these slum places especially in implementing laws that would halt man’s activities to protect and preserve the environment and ensure effective water governance structural operations. Though people are aware of the relevance of the preservation of the mangrove swamps, yet the demand to own a house has forced many to destroy these places and bank them to build houses. On the hill slopes and water catchment areas tree felling and indiscriminate construction work exposed the land to environmental hazards while the dams are subjected to pollution, evaporation and water shortage. The aspect of deforestation is a concern as the country continues to experience heavy storms that destroy houses in many parts of the country whilst boulders rolled down the mountains to destroy houses and lives. Although the Ministry of Agriculture is making frantic efforts in the communities to plant trees not much has been done towards that drive. The growth of the urban population is impacting on the quality of the water and health and sanitation facilities in our communities. In slum areas, the indiscriminate digging of boreholes without taking cognizance of safety precautions is a concern as most of these places are dug closer to poor sewage facilities. Poor water service delivery will affect the health status of the masses as it will serve as a breeding ground for the transition of water born diseases. To address the impact of urbanization of the utilization of the natural resources, there is the need to re-examine our laws governing the construction of unplanned structures in the slum areas or national protected areas and put mechanisms in place to halt this type of practice. It is good to ensure that at each stage of the deliberations, the stakeholders are involved so that their input will help to prevent residing in disaster prone areas. The Line Ministries like Housing, Lands, Water and Agriculture must collaborate in ensuring that the safety of the people is a must in implementing policies with regards to housing water service delivery and environmental practices. Water is a basic human right, as a result structures must be put in place to ensure that deprived communities are catered for. It must be noted that in a situation where this is not met there is bound to be local conflict between the people and the providers. It would be good in the interest of all to be planting trees in our communities and farms as this will help in halting natural disasters and provide the much needed water reserve. How long will the city of Freetown continue to depend on a dying water reservoir to provide clean and affordable water for over one million of its inhabitants that are living in deprived communities in various parts of the city. Every year at the peak of the dry season, access to pure and affordable water, is a very serious problem that authorities at the Water Ministry and the Guma Valley Water Company have not been able to address despite the erection of water tanks in various parts of the city and the setting up of a commission to regulate the supply and distribution of water in the country. With this water crisis, children and women continue to bear the brunt associated with fetching water from one part of the city to the next. At the points where few available tapes are running, people cluster in long lines waiting for hours or throughout the nights to secure gallons of water for domestic consumption. It is like keeping a vigil throughout the night as some of these places are so congested that some would hang around these places while others would be busy forcing their way to acquire water. This to many has a lot to do with the spreading of various diseases more so the Ebola Virus diseases as people in their quest to force their way into the crowd have no option but to have bodily contact. The peak of the dry season is a crucial moment for Sierra Leoneans to trek for water as the hot burning sun is responsible for excessive consumption or use of water in the homes. This inability of the stakeholders to ensure that the population have access to clean and affordable water at this time has exposed the dying water reservoir that we still depend on rather than finding alternative dams outside the city of Freetown as there is massive construction of dwellings places at the Guma Valley catchment and Babadorie reservoir thereby exposing the pipes to adverse conditions. The Babadorie Reservoir is far below the water level as the Sugar Loaf Water Reserve is dried up and cannot supply water to the dam. It is a year now since I made a tour of the various water dams and the Guma Valley water system that provides water to the city. During my visitation, it was heart bleeding to see the deplorable nature of our dams and water system that is not only polluted by the burning of the forest around these areas and the rubbish contaminating the water but also the massive encroachment of the land around these areas resulting in deforestation and rapid evaporation of the water from the dams. It is unfortunate that majority of the inhabitants of the city cannot make it to some of these places where these dried up dams are to see for themselves so that they have an insight of where the city is heading if immediate measures are not put in place now to ensure that we are talk with one voice of addressing the trouble as the ecosystem and the biodiversity in the Freetown Peninsular are vanishing at an alarming rate. . Many a time, people are been busy talking about the construction of a new dam. That one is in place but with investigation conducted, one can state that although it is a proposed site, there is already encroachment of this place and most of those involved are not the poor and marginalized but the wealth who have the influence to have their way in everything. The issue of digging bore holes in the city must be given a lot of consideration as there is the possibility of doing so closer to pit toilets. The city is so congested with poor sewage facilities even in the heart of the city where there are reports of sewage overflowing the streets. Speaking with some stakeholders about these controlled and unresolved problems, the same old stories are narrated like, operating old dams, cutting of pipes, increase in the population, encroachment of land around the catchment areas and a host of others but the actual solution is still unresolved. We are aware that water is life and a natural gift. There is the need for measures to be put in place to protect and improve on the water supply system. Awareness should be raised to stop the encroachment on the catchment areas and ensure and those found wanting must be punished and property sized so as to discourage others. If Freetown is to address the issue of water scarcity, we must now be thinking on new dams outside the city of Freetown. Officials of the Guma Valley Water Company were before the Parliamentary Oversight Committee on Water Recourses on Thursday 21st May 2015 to update the Committee on activities undertaken in 2014 and why the company is yet to supply sufficient water to the city. The company is tasked with the responsibility of providing sustainable water supply to the residents of Freetown and its environs. There have been lots of complaints over the years about the company not competent enough to meet its obligations to the nation. Chaired by Hon. Sualiho Monyaba Koroma, the Water Resources Committee summoned the management of GUMA Valley Water Company at Committee Room 1 in Parliament. The briefing according to the Chairman was the first time the management of GUMA had met with the entire membership of the Committee since it was reconstituted in the Third Session of the Fourth Parliament. He recalled that such engagements last year resulted in an oversight of GUMA’s existing facilities. He also assured the Management of GUMA not to feel intimated as the Committee was performing its oversight function, which findings and recommendations would be tabled and debated in Parliament for necessary action in the attendance of the respective MDAs. He furthered, that the briefing was not meant to witch-hunt anyone, but to sincerely discuss their status report; as MPs had a lot of water related issues in their constituencies in Freetown. In his briefing to the Committee, the General Manager of Guma Valley Water Company, Mr. Bankole Mansaray, said that he was excited to come to Parliament and described it as a routine exercise every year. He referred to Parliament as an integral partner to assist in solving the challenging water situation faced with Freetown. He also said that GUMA needed the support of politicians because if they failed in their duties; politicians would receive immense pressure from their constituents. He said that GUMA’s flagship dam at Mile 13 had a leakage problem with its square valve which had been purchased by DFID four years ago but it is yet to be replaced because of the risk involved, and efforts are being made to get a company from UK to do the replacement of the valve, the gadget that is used to clear the debris at a dam that is 850 feet above sea level. He called for the review of the GUMA Act, and told MPs that GUMA is receiving subvention from Government; and they paid for chemicals purchased for use at the water treatment works. Most of the issues discussed during the course of the meeting relate to the Committee visiting existing GUMA facilities; GUMA water sources in terms of daily supply, retention and distribution of water to customers, a review of the GUMA Act, alternative water sources at Wellington and other areas, the effects of water packaging companies in the East and the need to reduce them, regular water supply to Parliament, the protection of water sources from encroachment and deforestation, water tariffs, replacement of old and damaged pipes, the use of PVC pipes as against metal pipes, water engineering and taps use of meters, improvement of community water sources and use of bowsers, who controls GUMA among the Ministry of Water Resources, NCP, Energy and Water Regulatory Commission, and heavy capital investments for GUMA to provide clean and sustainable pipe borne water for residents in Freetown. The Chairman resolved at the end of the meeting that the Committee had a further dialogue with GUMA, NCP, Energy and Water Regulatory Commission, EPA, the Ministries of Lands, Works, and other stakeholders to chart the way forward. Today is Global Hand Washing Day, a day set aside by the United Nations General Assembly on Wednesday October 15, 2008 as the International Year of Sanitation, and Global Hand-washing Day, which stresses the need to reinforce call for improved hygiene practices. In the light of the above, Water and Sanitation Media Network Sierra Leone, a member of the West Africa Water and Sanitation Journalists Network (a sub regional organization) , is joining the Water Integrity Network, Water Supply and Sanitation Collaborating Council, IRC and West Africa Water Aid to observe this day. As schools are yet to re-open for the start of the 20142015 Academic year, WASH Media Network members will be out to some of the communities in Freetown and in the provincial areas to continue reaffirming the significance of holding fast to the correct methods of washing hands and the its vital place to the health of the children. It must be noted that most of the diseases that affect children are related to the poor environment and bad sanitation practices in our homes or communities countrywide. One among the outstanding odd health practices is that doing with children not washing hands before partaking of any food. This has continued to offer place to cholera and dysentery among the common diseases in record. Added to this issue is the fact that most children including adults find it difficult to use water and soap after visiting the toilet. The ramification of this bad health practice could not be unconnected to the 2012 Cholera outbreak in the country, which started in the Northern part of Sierra Leone and spread across its regions within two months. That period heightened the need to wash hands with soap as that was among the primary preventive methods since Cholera itself is water borne. Shanty towns and slum communities were among the places that suffered the brunt of the 2012 Cholera outbreak. Unfortunately, few months after the outbreak, people neglected the significance of washing hands with soap after taking part in any activity. This negligence went on until it was officially announced in May that Ebola had broken out in the country and that it expedient that people reverse to the traditional hand-washing method since the Ebola virus is a contagious disease. While the number of those who believe in the reality of Ebola has increased considerably, however, there is still sparks of remote cases of those who deny its existence and refrain from following the laid down health rules. Meanwhile, hand washing is paramount to a healthy society and it is on this note that October 15th has been set aside to reflect on responsiveness of hand washing with soap as an effective and affordable way to prevent diseases. With the outbreak of the Ebola virus in the Sub-region, school authorities in the region would use this opportunity to teach millions of children about this day. School authorities and parents must also ensure that water and soap are always at strategic positions for members to wash their hands. Let’s keep Cincinnati healthy by becoming Champion Handwashers! As an expert rightly said, “Clean hands save lives”, a driving theme for Global Handwashing Day. Children should continue to act as agents of change, taking the good practices of hygiene learned at school back into their homes and communities. Energy supply is a key to the socio-economic development of any community or state. In many developing countries, many depend on either Hydro power electrification or thermal plant. It is a new concept in the minds of most people to talk of a hybrid plant using both water supply in the rains and solar plant in the dry season to provide electricity supply for community people especially in remote or rural areas. In Sierra Leone, one area along the Freetown Peninsular that can now boast of this new development is the No. 2 River Community. Despite the poor status of the road network to getting to this area, it is a tourist resort centre, nice beaches, vegetation and a lot of water shed to keep the turbines in operation. It is in this drive that Welt Hunger Heilf WHH undertook a study on the identification of over sixty water sheds along the Freetown Peninsula and the need to preserve them for the sustainability of water supply to the western urban and rural district. With the collaboration of the European Union and other organization, one of the watershed was developed and protected to provide pipe born water supply for the No. Two River Community. With more potentials for this community, Welt Hunger Hilfe WHH strived very hard to ensure that most communities benefit from rural power electrification and water supply. Tuesday, 5th August, 2014 witnessed another milestone for this community as they were the first in the country to witness the commissioning of a Hybrid Electrification plant that will supply twenty hours of electricity during the Rainy and Dry Seasons. This remarkable development was graced by the Energy Minister and Deputies, development partners, tribal heads and dignitaries,. As a sign of gratitude for bringing development to their community, the Head of No. 2 River. Abu Bakraa Turam Conteh commended Welt Hunger Hilfe, the European Union, the Government and all who in diverse ways have contributed towards the completion of the project and prayed that more would be done so as to sustain and extend the project to other communities. Mr. Conteh further revealed that the development of energy technology plays an important role in the drive towards self sufficiency and called on the people to embrace the development at their doorstep. The Country Director for Welt Hunger Hilfe WHH Jochen Moniger said in 2011, the project started with the identification of watersheds so as to facilitate the supply of water to the communities. With much improvement, the organization later saw the need to work out modalities for the provision of electricity supply. With the commitment of the people work progressed on a sound footing as they were always prepared to render valuable services at all times. The Hybrid Electrification is one of the best of its kind. During the Dry Season, the Solar plant generates electricity for the people of Number Two River as the water level drops considerably while in the Rainy Season, it is the opposite, the mini hydro-plant generates twenty hours of electricity for the people. He further stressed that as a way of sustaining the project, the people must be prepared to secure prepared meters and pay their bills so that the money would be spent on running and maintenance cost. With the new hybrid power plant in operation now, this would help promote developmental programmes within the No Two River community, facilitate the efforts of the children to study at home, halt the noise generators have been making in the neighbourhood and even the black smoke they ooze. As a sea side resort, this would help promote tourism in the area and this in turn would boost the employment of youths and facilitate trade opportunities. Special commendation was made to the European Union funded project for intervening in the water supply system for drinking and other purposes. The Minister of Energy Mr. Thomas Macauley commended Welt Hunger Hilfe WHH and partners for such a laudable venture as it is in line with the vision of President Koroma to ensure that electricity is visible in all parts of the country. According to him, the commissioning of the Hybrid Electrification plant at No Two River signified the good work of the organization as without light, development would be at a standstill. The Minister admonished all to reflect on the prominent role of light in our societies, namely its importance in the hospitals, factories, industries, our homes, the internet, communication and several other aspects. The Energy Minister went on to state that it is but fitting that a similar projects are replicated in various parts of the country. With the commissioning of the Hybrid Electrification project by the Minister, a tour was made to the plant facilities where both the hydro plant and the Solar plant were inspected. This was followed by a demonstration of the new plant supplying the township with light that was embraced by the people. According to Moses Kamara, a Cinema Operator, this is one of the opportunities they have been longing for as it would help to curtail the fuel shortage that had adversely hit their business. He hoped that with this development, customers at his cinema would now get the much needed satisfaction, more so when international matches are being played. Marie Cole, a trader praised Welt Hunger Heilf WHH and all the partners that have contributed towards the growth and development of their community. ONE major reason for the drop in the water supply is the destruction of the watershed or catchment areas for timber and other purposes. 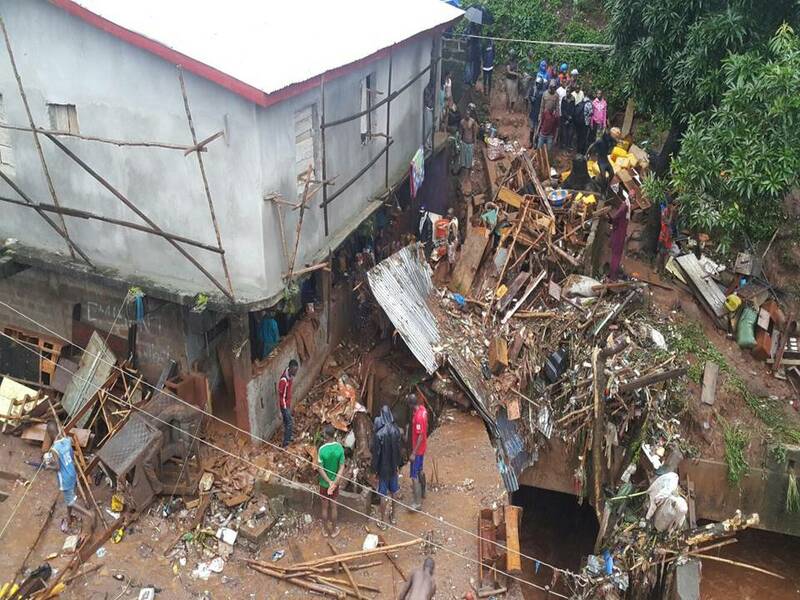 In the city of Freetown, the struggle for water continues as the Guma Valley Dam and other catchment areas continue to suffer from extensive deforestation. In a situation where stringent measures are not put in place, most of the watershed areas would be destroyed and this would affect the supply of hydro electricity and water supply to most communities. AS a way of working towards an “Accelerating Water Secure World, the Water Integrity Network has concluded its first African Water Integrity workshop in Zambia Lusaka from 29-30 April,2014. Through partnership with ECOWAS, EAC-Lake Victoria Basin Commission and SADC, the programmed trained around 500 water professionals. and 30 in total, to share their experiences, lessons learned and identify integrity challenges as we move forward. to the promotion of water integrity, support integrity ambassadors and ensure that anti-corruption policies are developed, and effectively implemented. Condemning corruption in public is not sufficient when implementation and enforcement of rules is neglected, undermined or obstructed at the same time. The challenges posed by depleting water resources are; fast population growth and urbanization, rapid destruction of productive aquatic ecosystems and climate change all threaten to overwhelm water management systems. Managing and maintaining the integrity of water resources is part and parcel of managing water with integrity. incurs huge cost for societies, in lives lost, stalling growth, wasted talent and degraded resources. There is no sustainability without integrity. The extent of the African water challenge was summarized in AMCOW’s 2012 snapshot: 344 million people in Africa rely on unimproved water sources. Corruption drains billions from the water sector, while more than 300 million people in sub Saharan. Africa live in water-scarce environments and 115 people die every hour from diseases linked to poor sanitation, poor hygiene and contaminated water. Development Goals (SDGs), in numerous international and regional declarations and conventions, as well as in stakeholder for a including the 6th World Water Forum, the Water Integrity Forum 2013 and the OECD Water Governance Initiative. The UNDP-Water Governance Facility together with its partners UNDP Cap-Net, WaterNet, WIN and SIWI, implemented the 3-year Regional Capacity Building Programme promoting and developing water integrity in Sub-Saharan Africa from 2011-2014. The lack of integrity reflects a multi-dimensional capacity gap across all African regions: gaps in basic skills and capacities of local communities, needed for meaningful participation, in professional skills for informed decision making and efficient service delivery, and in technical skills for dedicated integrity professionals tasked with developing organizational frameworks, enforcing rules and building organizational cultures. Beyond personal capacities, institutional capacities present a significant bottleneck and hamper the ability of national and regional bodies to effectively coordinate their efforts. Investment in capacity development is required across all levels, for communities, policy-makers, administrators, water professionals and the private sector. The momentum created by the regional capacity development programme should be translated into a sustained movement and expanded to neighboring regions. and how. Lack of integrity undermines how costs and benefits are distributed among individuals, society and the environment. for the inclusion of water integrity in international and regional fora, including AMCOW, the 7th World Water Forum, and the international consultations on the post-2015 development agenda. Future capacity development efforts should also include regional technical agencies and implementing bodies such as regional development banks, transboundary river basin organizations and regional courts. Freetown Water Sector in Coma: Who will remedy the situation? Whilst our politicians are busy with sugar coated words on improving the water sector, the actual picture on the ground about water service delivery in the capital is bleak and until urgent measures are put in place, the city will one day wake up to find that all the taps have finally run dry. Making an on the spot visit to the various dams and treatment sites that provide drinking water to the capital city and its environs by a team of Civil Society Advocacy Network on Climate Change (CAW-SL) headed by Charles Mambu, the Environmental Protection Agency (EPA), staff of the Water Sector and the Media on 13/3/2014, one was astonished to find massive deforestation along the catchment areas, encroachment on the land for construction of houses and mining activities, pollution and the drying up of the sugar loaf dam – signals that the water sector is in a bad state. Even though staff of the Guma Valley Water Company are advancing excuses that the dam was built a hundred years ago for a population of five hundred people, there are reasons for putting strategies in place to cater for the growing population. The road network to the various dams and water treatment plants are not only steep and rugged but a death trap to most vehicles. It must be noted that the ecosystem and the biodiversity in the Freetown Peninsular are vanishing at an alarming rate. This is mainly due to the uncontrolled and uncoordinated human activities in the Peninsular. Such activities include the use of the power saw machines for the cutting of trees and other vegetation around the demarcated forest reserves. the burning of wood for charcoal, construction of dwelling places, illegal sale of land, and mining construction at quarries by multi national companies. At the Guma Valley catchment sites, the dam that supplies most areas in the city of Freetown, the old pipes directly linking the city with water services are not only old and exposed to rust but now subjected to wild bush fires ignited by those clearing the encroached land for various construction purposes. Just by the gate, most of the areas have been cleared for vegetable garden and fire wood. At the actual dam sites there is a drop in the water level. Upon investigation, neither the staff of the water company, Lands officials nor the Foresters were in a position to state who was actually responsible for the deforestation or encroached of the catchment areas. At the Babadorie dam at Hill Station that supplies water to the Mountain Rural areas and some parts of the west end of the city and Pademba Road, the situation is very alarming as the dam is not only unprotected but partly dried up. I was informed by staff of the water company that before now two dams, namely the Tacugama Dam and the Sugar Loaf, have been supplying water to the Babadorie treatment plant for the Mountain Road areas. The structures and ashes from the massive bushfires around the dams and treatment plants are dangerous to the survival of the plant. 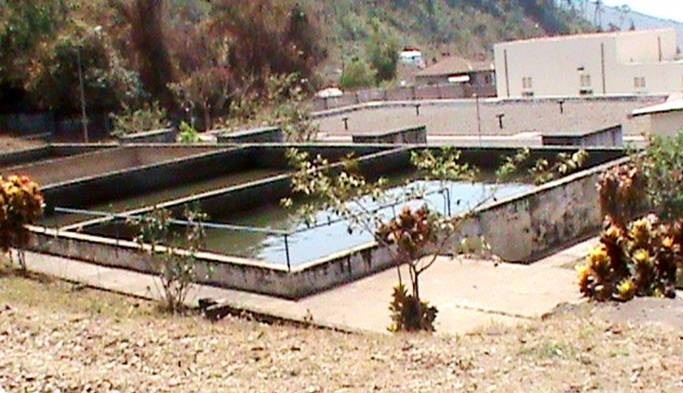 There is all the possibility for the houses overlooking the dam at Babadorie easy to contaminate the water as a result of the poor sewage facilities closely built to the dam. Though staff of the water company are very quick to tell the public that plans are on the way to very soon construct new dams to address the poor water service delivery in the city that is almost housing two million people, the proposed site is currently facing challenges of encroachment and the building of houses. One thing that stands out clearly in all this is that the masses continue to be denied access to affordable and quality drinking water while the wealthy and highly placed in the society continue to receive supplies of water from the Guma Valley Buzzers. To the encroachers what matters is getting land at all cost and depriving the majority from getting water by building around the catchment areas. At the Tacugama dam at Regent – Grafton, poor road network has isolated this area exposing it to all forms of activities that are drying up the dam at an alarming rate. If with what is ongoing in the wetlands and catchment areas are not of concern to the water ministry. Today our water sector continues to be in a state of Coma as a result of the following challenges. Stakeholders in this sector are not in a position to give the actual picture of the demise of our water service delivered to the masses, more so when such places are isolated and dangerous places. Their messages are always “we will soon improve on the water service delivery as we have signed contracts with partners”. There is a lack of coordination among the staff of the water sector, foresters, lands and security agencies in protecting the catchments and land around the dams. As a result of this, influential personalities are using this opportunity to grab land indiscriminately. It is very difficult to see demarcated zone in these places. Punitive measures have not been instituted like the demolishing of structures or the imposition of heavy fines as a deterrent to others. If we are to see a remedy of this dismal situation the following must now be put in place. The security officers operating in these areas must be increased and empowered to arrest all those engaged in illegal activities. There should be mass demolition of all houses around the catchment and forest reserved areas. The officials of the water sector must give out regularly the correct picture of the status of the water system to the public. There should also be massive education of the public on the adverse effects of encroachment and deforestation of our reserved forest areas and wetlands. If Freetown is to address the issue of water scarcity, it is now time to protect and preserve our water catchment areas, construct new dams and embark on massive awareness campaign on the effects of man’s activities on the environment. 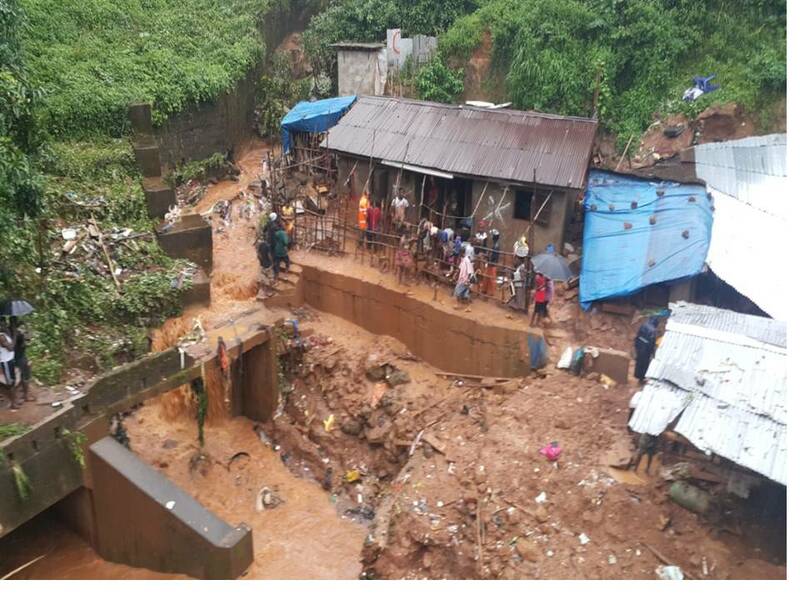 The current status of the water service delivery in the city of Freetown will become acute if urgent measures are not put in place to halt the massive encroachment of land in the catchment areas. A team from the Civil Society Advocacy Network on Climate Change, the Deputy Mayor of the Freetown City Council, Staff of Guma Valley Water Company, SLAWACO, Staff of the Forestry Division, the Environmental Protection Agency and the Media made a visit on Thursday, 13th March, 2014 to dams and treatment sites. The visit to the Guma Valley Water Company, Tacugama reservour and the Babadorie sites was to get firsthand information on the environmental hazards plaguing our catchment areas. The ability of the water agencies to continue supplying water is seriously undermined as a result of the exposure of the water dam to direct sunlight; this in return is a serious threat to the supply of water to the growing population in the city and its environs. At the Guma Valley catchment and Babadorie reservoir it was alarming to note that a massive construction of dwellings is ongoing and not only on state land and this exposes the pipes to adverse conditions. The Babadorie Reservoir is far below the water level as the Sugar Loaf Water Reserve is dried up and cannot supply water to the dam. At Tacugama , it was also note that the water level cannot serve the majority of the populace if steps are not taken to remedy the situation. Addressing the delegation, the Guma Valley Boss Mr. Bankole Mansaray extended his gratitude for embarking on a campaign to create awareness on the destruction caused by human activities to the Freetown Peninsular with the view that policymakers and communities take the required steps to halt the envirommental hazards. The Head of the Environmental Protection Agency Madam Jatou Jallow stressed that water is life and a natural gift. It should be protected at all times and our duty is to raise the awareness to stop the encroachment on the catchment areas and ensure that pure water is available to Sierra Leoneans. She further recommended for very tough action to be taken against all those erection structures on the water catchment sites. The high rate of corruption in the Water Sector continues to have devastating effects on the lives of the deprived and marginalized communities in developing countries to the point that many die from either contamination or water related diseases. According to the Program Manager for Water Integrity Network in Sweden Mr. James Laten, the past ten years had witnessed a period in which over thirty billion dollars US$ 30 billion fund invested in the Water Sector in developing countries go into wrong hands. If we are to make a reverse of this dismal situation where the billions of dollars invested in the water sector is reflected in the lives of the ordinary person, there is the need to put mechanism in place to monitor water projects at all stages and heads of water institutions give account of how funds are utilized. How long must this situation continue where the wealthy and those highly placed in society enjoy and access pure and safe drinking tap water leaving the majority of the poor community to trek miles for just a bucket of water? When will the deprived and marginalized on the hill top areas, the slums, camps and remote villages say “we too can now boast of pure drinking water? When will our politicians stand by their manifestos by providing pure and affordable drinking water for their subjects? Governments in various places tend to shift the blame on the masses and on the other hand the masses shift the blame on the Government for not meeting its responsibilities. The issue of accessing pure and affordable water is a fundamental human right but this is not given the much needed attention. Corruption in the water sector is ripe and involves all classes of people ranging from the ordinary man, politicians, Heads of Water Institutions and even Non-Governmental organizations working in this sector. Report on “Corruption in the water sector” by Water Integrity Network in a book titled “Training Manual on Water Integrity” states that in the sub-Sahara Africa, forty-four percent (44 %) of the countries are unlikely to attain the Millennium Development Goal target for drinking water eighty-five percent (85%) are unlikely to attain the sanitation aspect. Estimate by the World Bank report suggests that twenty –forty percent (20 – 40% ) of water sector finances are being lost to dishonest practices. Talking about corrupt practices in the water sector there are lots of reference points to make in the case of Sierra Leone. As a result of greed and selfishness, we today tend to embark on the following activities that in turn affect the effective operation of the water service delivery system. Refusal to pay for water rate bills regularly to the water sector, Removal of pipes or water facilities machines parts for sale as scrap metal. Substandard projects by some contractors and the lack of transparency and accountability by some authorities and the marginalization of certain areas that already have water service delivery structures only to be rehabilitated but due to certain unknown reasons, the inhabitations continue to go for years without pipe born water and the proliferation of water industries operated in the houses of most people. It must be noted that Kambia District is a melting pot in the country as people from all parts of the country and neighbouring Guinea converge to do a weekly trade activity. As a result of this, there is the need for a sound sanitation practise and access to pure drinking water so as to avoid the outbreak of cholera. Unfortunately when this was not adhered to, it was a breeding ground for the spread of cholera that affected the lives of many people in the country. Kambia District, with a population (2010) of about 308,929 (Statistics Sierra Leone), has the lowest percentage (27%) of households with improved source of drinking water in the Northern region and below the national average (57%). There are 992 protected water points in the district, out of which only 549 are functional. Of the 443 non functional water points, 106 are partially damaged, while 270 are completely broken down. These non functional wells are mostly as a result of the lack of maintenance or a defined strategy of sustaining the operations of the water points. One major excuse advanced last year was that some of the inhabitant refused the payment of Le 15,000 (Fifteen Thousand Leone) monthly water rate bill per household and that almost halted the effective operations of JICA & Sierra Leone Water project. In Moyamba District, Kori Chiefdom Taiama, water infrastructure that had been abandoned for almost twenty years is slowly becoming a zone for scrap metals as youths are seen either climbing the tanks, the machine rooms to grab whatever they could. Kori Chiefdom hosts the oldest provincial University in the country; Njala University yet, access to pure and affordable drinking pipe born water is a dream to be actualized. In morning, it is survival of the fittest to get water from boreholes or wells with hand pumps. In the city of Freetown, the search for pure and affordable water has forced many to embark on unhealthy practices at the detriment of the little water delivery service. Though the Government intends to shift the low water service delivery in the city to the pressure on the Guma Valley Dam, to many this is not acceptable as there are other quality dam around the city that must have been developed to supply other parts of the city. Most people who cannot get the flow of the Guma Valley water to their respective communities in the east or mountainous places cut pipes to scoop water whilst others embark on illegal connections. It is hearts bleeding that long lines are visible around a single pipe born tap and many spent hours without getting water. At these points, illegal fees from buckets or gallons on the grounds that the money is used for cleaning the tap. In mountainous region of the city, precisely Allen Town or the Wilberforce area, community bore holes exist which are controlled by certain individual for which a minimum sum is paid. The unfortunate aspect of this is that the locals lack the contents of chemicals to clean the water wells or improve on the status. With regards to substandard work or political influence, some organizations working on the construction of water wells are under pressure to select areas closer to the houses of traditional authorities rather than looking out for ideal sites that will maintain water throughout the year. With such poor judgment, politically influenced or substandard wells do not survive the retention of water in the dry season as a result they wells are not up to the task for which they were constructed. The lack of access to pure water supply is still a major concern especially in the in the eastern parts of Freetown where it is either you are up till 12pm or 4am to get water. Thunder Hill is one of the most deprived communities with children abandoning their schools in search of water by using wooden trolleys to secure water on commercial basis. Alpha Kamara, the caretaker of the Pompidou Ground well in kissy, in an interview revealed that access to pure water is still a major problem at Thunder Hill as the Pompidou Ground Well is serving hundreds of residents on a daily basis from various communities including Lowcost, Brima Lane, Portee, and Jollah Terrace among others, being the only source of water during the dry season. He nevertheless cited the poor sanitary state of the well, noting that some residents use it for drinking purposes which has a negative impact on their health. The statement of “ we have signed contacts with companies and plans to construct modern water facilities in various parts of the country is not a news to us so we want action now. We have already commenced a crucial period in the year, the Dry season that will witness the drying up of streams and rivers so what is the Ministry of Water Resources going to do to address this situation? It is the end of the rainy season and the soil keeps drying and water losing on it. This is marking the start of the struggle to get clean and affordable drinking water for communities in remote areas of Sierra Leone. Children and their mothers are greasing up their feet and stretching up their heads to start searching for any source of water they can set eyes on for their domestic uses. As part of a fellowship from the West Africa Water and Sanitation Journalists Network, I traveled 248km North of Sierra Leone to get an information on how rural communities are coping up to access safe and clean water in their localities. On my arrival at Kamabala in the Tonkoh Limba Chiefdom of Kambia District, the situation is very much appalling seeing community of more than 7000 people struggling to fetch water from a more deplorable water source dug by an 18 year old village boy. The statement above is not the real situation for rural communities in Sierra Leone. The water source for the Kamabala community was dug below the Bamboo canes and located down a hilly route from the village. There is no electricity to help purify water in major provincial communities in the country and digging a well in Bamboo trees like this will certainly help get natural coldness of water for the community. A visit and sit of half an hour made me to see more than 100 women and children struggling to fetch water in the well. The distance is about 200 meters from the last house in the community and during the raining season, all the debris and filthy including human wastes from the community are transported to this downstream valley. The dung beetles are rolling balls of human feces whilst the flies are dancing around and singing praises to a child who has just deposited some human wastes about 5 feet from the water well. The local water-village-savior, Sieh M Dumbuya attending the Wesleyan Secondary School, Kamabala has been searching for water points during the past years and “when I discovered that people have started to suffer for clean and affordable water, I came to this water-find which I believe will serve a long way this year” he said. All residents in the Kamabala Community depend on this water for both their drinking and domestic use as confirmed by Sieh and the Chief of the community. Sieh said he dug the well so that he can save the health problem of the community. A 45 year old Fudia Conteh said “this water source will soon dry up and after such; we will start to fetch water at the tap provided through the assistance of a local NGO in the district. But all these taps are not reliable for the community. The Banekeh River is dividing Kambia and Bombali Districts and it is also flowing North of Kamabala settlement. When the tap water and some major water source in the community dry up, the only source for the women at the peak of the dry season is to walk a distance of 4km to get water for their homes. “Even if you want to cook or drink, you must walk this distance to get water or else you stay with none” the 45 year old Fudia said. She said “the water is not clean but it is the only source which has been keeping us alive for the past thirty years”. A 25 year old house wife, Sallaymatu Kargbo also confirmed that there is no other means of getting clean water for the community and because of this situation they must adopt to the water system. They are used to drinking red-dish water in the community with no official health problem reported from them. “We have no way to do” she said. School going Children in the Kamabala Community will first fetch water for their parents in the morning and probably wash their mouths at the water well before they can think of going for their schooling on week days. If they try to avoid such task for a day, they will be meted with a lesson that they will never forget in their life time. “I fetch water before going to school and after school also” a class 4 school pupil said. The official service providers for water supply in Sierra Leone are the government owned Guma Valley Water Company in Freetown and the Sierra Leone Water Company (SALWACO) and the Local Councils. With a new decentralization policy, embodied in the Local Government Act of 2004, responsibility for water supply in areas outside the capital city was passed from the central government to local councils. Official reports at the Sierra Leone Water Company indicates that as of 2012, SALWACO only provides piped water in Lungi in the Port Loko District, Makeni in the Bombali District, Bo and Kenema districts and was in the process of providing for residents in part of Pujehun and Koinadugu Districts. Officials at the SALWACO and Local Council in Kambia out of anonymity revealed that there is yet no ways for providing pipe-borne water in many major towns of Kambia District, not to mention of smaller ones. The Water Company is supposed to transfer water service provision to Local Councils and this has not happened so far because of little capacity to do so. There are still many people in the world that still do not have sufficient access to safe drinking water. Official United Nations report indicates that about 884 million people don’t have access to clean water of which about 340 million people live in Africa. Globally and on a daily basis, 200 million hours of women’s time is used in fetching water and official statements indicate that this leaves them extremely vulnerable. Results also highlight that 3.6 million people die annually from water-related diseases. Sub-Saharan countries only store 4% of their annual renewable flows. Compare to 70-90% in developed countries. In Sierra Leone, the Government of President Ernest Bai Koroma has just separated the Ministry of Energy from the Ministry of Energy and Water Resources to further responsible for water and sanitation policy in the country. With the unavailability of plastic and bottled water supply in the rural town of Kamabala, it is not yet clear when these rural women will stop drinking red colored water that has great potential of making them and their children get sick. Besides the fact of the government Sierra Leone’s key and importance role towards ensuring clean and affordable water for its citizens in the country, sons of the soil of Kamabala may come in for assistance towards this trend. The town itself is a producer of prominent descendants presently living in the city with some working and holding vital positions at the University of Sierra Leone and the National Revenue Authority but they hardly come back to the village and help to the water or whatever assistance the Community may need. Definitely and most certainly, if all these personalities come out and start mobilizing to save their Community, the crisis the Kamabala is facing will obviously be a thing of the past one day and rural women will breathe a sigh of relief.